There were a lot of great performances from the Bills’ defense, but Lorenzo Alexander at linebacker had himself a great game and made multiple big stops. He was all over the place, not just getting tackles in the run game but also affecting it without recording any stats. He was also fantastic in his coverage, as he sniffed out screens and stopped check-downs from going anywhere. The Bills’ defensive line, in general, was dominant all game, but the standout to no surprise was edge rusher Jerry Hughes. He was a consistent presence in the backfield, as he recorded multiple QB pressures even without registering a sack. He was also solid in the run game and a big reason that the Lions’ rushing offense wasn’t effective despite averaging four yards per rush (a majority of those yards came after contact). It was a true breakout game for former Alabama WR Robert Foster, who, while giving hints of his arrival over the last couple games, erupted for over 100 receiving yards, swallowing up four-of-five targets. Foster sealed the victory for the Bills with a 42-yard snag on a post where Lions’ Mike Ford was defenseless to prevent him from reaching the end zone. It would be incorrect to label the Bills’ victory as pretty. The offensive line played a standout role in protecting their quarterback, and rookie first-round QB Josh Allen showcased his arm cannon and plus-speed on several occasions. However, the rushing attack failed to get gain anything significant with both LeSean McCoy and Chris Ivory inactive and Marcus Murphy going down, as well, during the first half. Keith Ford would be supplied with 14 empty carries, but Allen scrambled away from pressure during their opening drive of the second quarter to put Buffalo’s first points on the board. The Lions started off this game looking good with QB Matt Stafford seeming to make an effort to look deep early. And he had success there, too. But as the game wore on, he started reverting back to check-downs and passes well short of the sticks. A big part of that was the Lions’ offensive line, as Stafford was under pressure seemingly every other dropback. But Stafford still was looking to check down almost immediately, and the Bills’ defense sniffed those out easily. The lone bright spot for this Lions’ offense was WR Kenny Golladay. It’s been a tough few weeks for him, but he finally got back on track with a huge game. He had three or four huge catches early on that were all him just making a play and going up and getting it. He had one catch in the second quarter where he essentially stole what should’ve been an interception on third down in their own territory into a 24-yard catch that extended a drive that ended in the Lions second touchdown. Lions DB Darius Slay played an excellent game, especially during the second half when he collected a handful of pass deflections with the Bills in come-from-behind mode. Detroit’s defensive interior, led by Damon Harrison, stifled the Bills’ ground game, with rookie LB Jarrad Davis cleaning up the remains to lead his team in tackles. 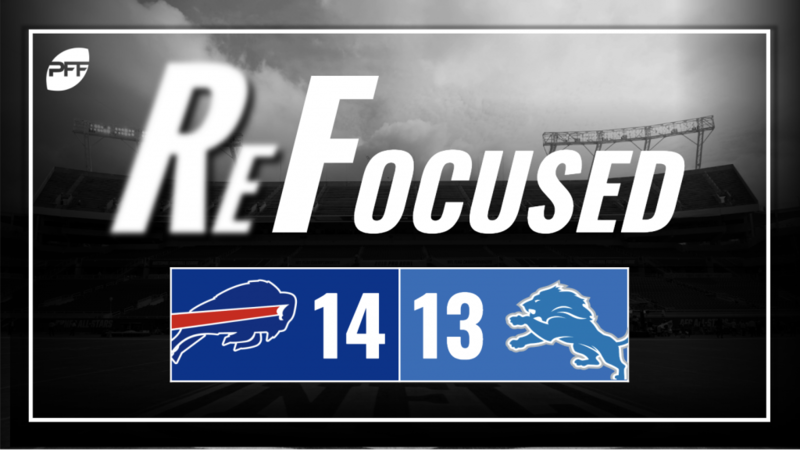 The Bills’ offense may not have been overly impressive, but they did enough for the victory and submitted several positive individual performances to provide hope for the franchise moving forward. The Lions’ offensive line couldn’t handle the Bills defense, and the constant pressure they allowed prevented Stafford from getting into any kind of rhythm throwing the football.